It can be found, then lost, and found again in an untitled 2009 artwork by Kevin Veronneau. A long strip of wood and masonite renders the revelatory noun in the reflective paint used for crosswalks. View the signage from one angle and aha! Total understanding. From another vantage point, however, the text disappears, and the viewer is greeted by a void. Veronneau is one of the stronger contributors to “Word: Text in Contemporary Art,” at the Jamestown Arts Center through Aug. 13. The exhibit was organized by Karen Conway, the arts center’s exhibitions director, who’s crafted an enticing survey of visual artists working with words. Take, for instance, Barbara Kruger or artist Glenn Ligon — both big names in the international contemporary arts scene, and far from the usual fare one expects of a regional venue. The local offerings are no less substantial. Robin Crocker, a Bristol-based artist, contributes “Sings Only Tranquil Fear Now,” a wall-mounted set of colorful wooden blocks that invites rearrangement from visitors. It’s a savvy alternative to poetry magnets, both malleable and entertaining. Brooklynite Lesley Dill was obviously favored in Conway’s curatorial vision, her presence especially noticeable with a large drawing and an array of puppets and ethereal embroideries. The puppets’ cloth bodies are swaddled in verse, an enchanting (if somewhat mutilative) means of distilling poetry to its essential visceral nature. 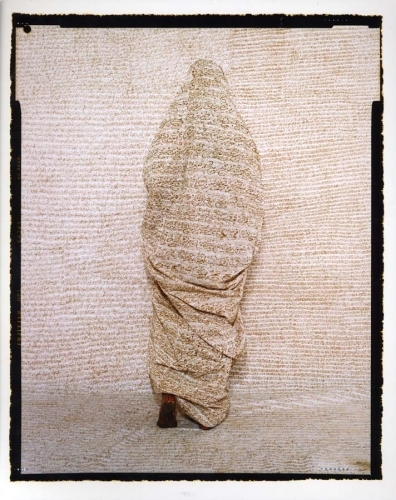 Lalla Essaydi’s photograph “Converging Territories #29” pursues a similar idea, to earthier results. A cloaked woman’s back is turned from the camera, her shape and even surroundings swaddled in sumptuous, swirling eddies of Arabic calligraphy. Wakefield artist Alexandra Broches likewise pours history, culture and personal narrative through the sieve of language. Her “Veiled Barbara, 1943” superimposes a photograph of her cousin with a letter written by the girl’s father — mementos of Broches’ relatives, who died in Nazi concentration camps. It’s a haunting and profound juxtaposition, even if you can’t read Dutch. Indeed, the best work here is usually that which hits hardest, such as the work of Jenny Holzer. A Rhode Island School of Design graduate and art celebrity known for her massive public signage, Holzer is a dazzling curatorial achievement on the part of Conway, who secured the artist’s formative “Inflammatory Essays” on loan for the exhibit. Printed on eye-catching, jewel-tone paper, these lithographs were originally posted around New York City in the early 1980s, functioning as public service announcements of rapture, irony and the utmost acerbity. “Guns make wrong right fast,” reads one poster. Apropos of their scorching sentiment, Holzer’s essays are displayed and protected in a glass case. Given the all-ages audience at the art center, these vibrant polemics have been strategically arranged so as to veil certain curse words. Right beneath the surface are Holzer’s salvos, evidence (like this exhibit) that text is as flexible and incendiary as image. Inflammation from one perspective might be enlightenment from another.